We are seeking a volunteer based in Sydney for a one-day per week appointment to build, manage and engage our community of artists, actors, writers and interns who create stories about mental health to educate and reduce stigma. We have been running as a mental health storytelling organisation since 2016 but the community we are building at madnarrative.org is new and has become an independent unincorporated entity funded by our nonprofit and chaired by the nonprofit’s founder (Dr Mark Tayar). The central aim of this role is to attract creative and energetic people and channel their talents to tell stories of some of the four million Australians affected by complex mental illness. This especially includes mental health consumers but also carers, professionals, peer workers and advocates. If you have experience in nonprofits, writing, art, theatre, film, education and/or mental health, we need your talents. As our funding sources do more fundraising for us and as we get more in-kind donations from corporates, we may be able to invite you to a paid part-time role but this will take at least 9 months. In any case, we will provide a strong recommendation letter and allow you to use a senior person as a referee if you do good work for us. 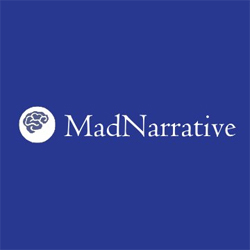 MadNarrative was established early this year as an extension of work done for SANE Australia, the Ol' Mate Foundation and Mad Stories. We formed an unincorporated entity and are recruiting volunteers, interns and new Office Bearers to change the way stories about mental health are told in Australia. We have a space in the garden of Mad Stories known as the MadNarrative Garden Studio. The studio is opposite the Bar Italia in Leichhardt and is tiny but can serve 4 clients/volunteers at a time in different spaces. We are pitching to Bunnings and Inner West Council to rejuvenate this space for use as a therapeutic gardening and art-making space with advice from our friends at FoodFaith Ltd who run community gardens. We also use a free coworking space provided by Mirvac Retail in Broadway but that space may close in late October. We have training space for up to 6 people there in a noisy but well equipped part of the shopping centre. Interns from UNSW and UTS are currently being screened and will work from their university, the Broadway space or Leichhardt. The most important thing to know about MadNarrative is our values. If they align with your own, get in touch with us at madnarrative@gmail.com.